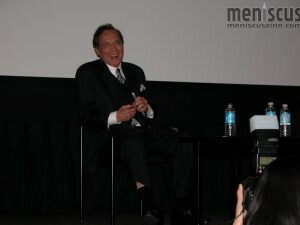 Shigeta participated in a Q&A session following the screening of his 1959 film “The Crimson Kimono.” In Samuel Fuller’s film noir, Shigeta’s presence was notable for several reasons. His character, Detective Joe Kojaku, gets tangled in a love triangle with his fellow two leads played by Glenn Corbett and Victoria Shaw – and he, not Corbett, ultimately wins the girl. Shigeta’s heritage, both on screen and off, as a Japanese American allowed Fuller to shoot in the historic Little Tokyo district of Los Angeles, a rare glimpse into a booming neighborhood that is difficult to find on film today. Shigeta spoke without a stereotypical broken accent in the film. And finally, for his work in “The Crimson Kimono,” he was a co-winner of the Golden Globe for the Most Promising Newcomer – Male in 1960. James Shigeta: Sam Fuller was very, very admirably adamant about the fact that the Japanese be correct. He admired the Japanese customs and people, and…great man. I was very fortunate to work with him on my first film, and was Glenn [Corbett], and we were all under contract to Columbia Studios at the time, and Victoria Shaw who played the lovely girl… I think she was the only one that made a previous film. She was in “The Eddy Duchin Story,” one of Eddy’s wives, and neither Glenn nor I had ever done a film like that. Sukhdev Sandhu, moderator: It was directed by a filmmaker of the caliber of Sam Fuller as well. What do you remember of making that? I will get very queasy watching the film. I get queasy watching myself in anything, and especially the very first effort. It was very nerve racking to watch, because I think I’ve learned so much since, and well you see all the terrible errors you make and stuff like that. Overall, it was very fun. The director was very cunning. It also reminded me, I mean, I think Jack made this point about there’s this sort of acting as well. Who were the actors that you admired, that you looked up to when you were growing up? When I was growing up, a lot of people I looked up to. I never thought I was going to become an actor anyway. My major in college was in English, and I wanted to be either a writer or a teacher, and I might still be on that course, but it was very accidental, and I never intended to be this way. And asked if I would do a film, and I said it sounded like fun, and I did it. I happen to be very old too. …a precursor to American Idol, which ran on radio from the 1930s, and I think on TV from the early ‘50s to around 1970. Many of these winners include people like Pat Boone. Frank Sinatra was discovered through there. Were you envisioning your future as a singer? I always intended to be a singer. With acting initially, people would go on stage and I think it taught more technique than method acting which I think was a more practical way to go. You didn’t have to take hours or minutes to get into the mood to do a take. You developed a technique to do it almost instantly.